Doggie Diner was a small fast food restaurant chain serving hot dogs and hamburgers in San Francisco and Oakland, California that operated from 1948 to 1986, owned by Al Ross. The first Doggie Diner was opened on Oakland's San Pablo Avenue in 1948 and grew in popularity. At one time there were 30 locations around the San Francisco Bay Area, mostly concentrated in San Francisco. The chain went out of business in 1986 after trying to compete with big chain restaurants, such as McDonald's and Burger King. Its founder Al Ross died in 2010, at age 93. Manny, Moe & Jack, Harrison and Dore, San Francisco, 2015. 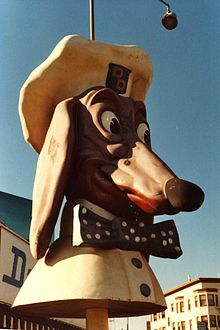 The most notable feature of the Doggie Diner chain was the sign: a 7-foot-tall (2.1 m) rotating fiberglass head of a wide-eyed, grinning dachshund, wearing a bow tie and a chef's hat. These famous dog head signs were designed in 1965 or 1966 by Bay Area billboard and ad layout designer Harold Bachman. After the Doggie Diner went out of business, all the large dog head signs were taken down and many were resold to private parties. In 2001, one of the dog signs, restored and refurbished by the city of San Francisco, was installed on a median strip at Sloat Boulevard and 45th Avenue, near San Francisco's Ocean Beach and the San Francisco Zoo in the Outer Sunset neighborhood. On August 11, 2006, the Doggie Diner dog head became a San Francisco landmark No. 254. Zippy frequently participated in his long-running conversation with the giant fiberglass doggie mascot. In 2004, Laughing Squid, a website founded in San Francisco, sponsored three of the dog heads – named Manny, Moe & Jack – as the "Holy Dogminican Order" to take the dog heads on a cross-country trip, ending in a show by Cyclecide at CBGB in New York City. The trip was documented in a movie called "Head Trip", released in 2008. In 2013, Yarn artist Olek crocheted bright colored yarn over three of the dog heads as an art piece. "Doggie diner!" was the battle cry of the Batwinged Hamburger Snatcher (BWHS) character from Dan O'Neill's Odd Bodkins weekly newspaper comic strip. ^ a b Fimrite, Peter (April 5, 2010). "Al Ross - Doggie Diner founder - dies" (Website). SF Chronicle (SF Gate). Retrieved Nov 11, 2013. ^ "Doggie Diner Founder Dies" (Website). NBC Bay Area News. April 6, 2010. Retrieved Nov 11, 2013. ^ Harold Sherwood Bachman (born 12 June 1921, Pittsburg, California; died 2 October 2005, Santa Rosa, California). "Harold Bachman -- designer of beloved Doggie Diner icon". 2005-10-06. Retrieved 2014-01-10. ^ Herel, Suzanne (July 1, 2001). "Puppy love reigns as Doggie Diner head returns / Cheers as icon goes back in place" (Website). San Francisco Chronicle (SFGate). Retrieved Nov 11, 2013. ^ Prete, Tom (June 9, 2011). "Former Doggie Diner set for demolition" (Website). Ocean Beach Bulletin News. Retrieved Nov 11, 2013. ^ "Doggie Diner Sign" (Website). Art and Architecture San Francisco. July 12, 2012. Retrieved Nov 11, 2013. ^ Kasey Smith (July 20, 2011). "Doggie Diner Head". localwiki/sf. Retrieved Nov 11, 2013. ^ Tudor, Silke (Aug 18, 2004). "Last Crawl". SF Weekly. ^ Casey, Laura (2008-01-22). "Get along, (not so) little doggies Quirky collector takes his large-scale Doggie Diner collection on the road for film called 'Head Trip'". Oakland Tribune. Retrieved 2018-10-23. ^ Beale, Scott (2008-01-21). "Head Trip, A Doggie Diner Dog Head Cross-Country Documentary". Laughing Squid. Retrieved 2018-10-23. ^ "San Francisco's Doggie Diner Heads Get a Crafty Makeover". Dogster. Retrieved Nov 11, 2013.